Very often, it is alleged that justice is the highest goal of political life, yet for most folks in <?xml:namespace prefix = st1 ns = "urn:schemas-microsoft-com:office:smarttags" />Africa it is instead injustice that continues to dominate political debate. The political bloodshed that we saw in Kenya following the dishonourable re-election of Mr Mwai Emilio Kibaki on December 30, 2007, is a contemporary classic case in illustration. Three days earlier, Kenyan voters, assumed for a long time to be passive overwhelmingly reject the Moi/Kibaki/Kalonzo/PNU monotonous political menu, where the equation was haphazardly illustrated as one plus one is four and not what is factually known. On the day of elections, voters armed with change in mind left their houses as early as 4.00am to cast their votes enmass, according to the Electoral Commission of Kenya (ECK), registering 75% of a possible 14 million electorate, the highest ever turnout in Kenya’s electoral history. The voter’s resilience, for some of us here in the diaspora seems to hypothesize an argument that I’d published elsewhere prior to the election: “No man has enough prestige to tell or make wanainchi (citizens) believe or accept any testimony which seems contrary to their experience. It is indeed a matter of weighting the evidential value of the experience”. I also went on to forecast that “a catalogue of factors, failures, inaction as well as actions that were likely to influence the defeat of Kibaki’s PNU (Party of National Unity) and give Raila Odinga’s ODM (Orange Democratic Movement) victory in the general elections were many but the selective dispensation of justice was likely to be amongst those at the forefront”. 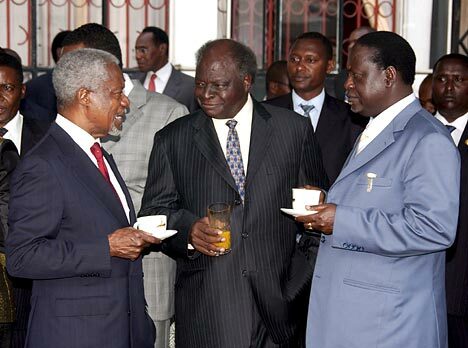 Back then in 2002, it was Raila Odinga’s campaign and declaration of ‘Kibaki Tosha!’ that did it for Kibaki; the then written–off Democratic Party leader who had ran for the presidency twice (1992 and 1997) and lost. At that time, there was hope of Kenya being a successful country, with a new democratic outlook, following Kibaki’s election that also marked the end of the Moi era, or so the Kenyan mwanainchi deliberated. Kibaki, prior to the elections, sporadically referred to as “Moi Kibaki” and post-elections as “Kibaki Asibaki” by his adversaries because of his close associations with the former President, went under fire from the electorate who rightly saw him as having failed to fulfil their valid expectations. The reforms which he promised in 2002 included the rapid completion of the current constitutional review process that was finally competed in March 2004, after much infighting among the coalition. And, it was not until July 2005, that the draft was finally presented to parliament for debate and amendment. The so called ‘Wako draft’ that the Parliament ultimately gave to wanainchi (citizens) for public approval by referendum was very different to the one agreed earlier at Nairobi’s (Bomas) national constitutional conference. Most contentiously, the re-drafted document retained the powers of the President and central government. Sixty per cent of those who voted then resoundingly rejected the document. When it came to the general elections, the electorate’s dismissal of Kibaki’s 21 cabinet ministers was a vote of no confidence in his administration. It is also a protest vote aimed at recovering democratic strides gained after Moi’s 24 year dictatorial rule. President Kibaki’s newly-formed PNU was seen as a desperate last minute political attempt aiming to recruit narcissistic, frightened men (Uhuru Kenyatta et al), whom for the sake of their political and economic safety, would like to recycle themselves in the helm of power by any means. Thus, it was the ill-considered decision by a group of hard-line Kikuyu leaders to return Kenya's 77-year-old Mwai Kibaki to office in spite of him losing six of the country’s eight provinces to Raila Odinga’s ODM that went on to trigger the worst violence the country has even seen since the British-imposed emergency of 1956. It is reported that over 3000 people have been killed, thousands are still missing, while almost a million are now either refugees in neighboring countries or internally displaced. Questions are being asked by many: Why would the people vote out most PNU MPs, and then vote in a PNU President? How could some constituencies have more votes tallied than voter turnout for those stations? How could there be fewer votes in the MP boxes than in the Presidential boxes for one station? In my recent interviews on the BBC, I have been arguing that the election troubles are not a Raila-Kibaki conjecture, but instead, it is the injustice done to the electorate. It is in this connection that most of us have shored up peaceful direct action against the PNU regime, as it does not have the mandate of the Kenyan people, and we also want to reinforce a sense of justice. Just as freedom can exist only in conditions of democracy, so democracy can be genuine and effective only on the basis of legality and social justice. It is a fact that there is an organic connection linking democracy, freedom and legality together. Ronald Elly Wanda is a contributor to The New Black Magazine and a political scientist based in London.